Stage 1 mesothelioma tumors remain localized in and around the tissue lining of one lung. Treatment options for stage 1 offer a longer life expectancy. Prognosis is better at this stage. The 2-year survival rate for some patients is 41-46 percent. Registered nurse and patient advocate Karen Selby describes early-stage mesothelioma and how it differs from a late-stage diagnosis. At stage 1 pleural mesothelioma, tumors have developed on the pleural lining. This is the thin protective tissue surrounding the lungs. Cancer cells have not yet spread through the lymph nodes or bloodstream. Early-stage mesothelioma has a better prognosis than cancer diagnosed in later stages. Surgery, radiation and chemotherapy are more effective at controlling stage 1 disease. Controlling the cancer prolongs life. The first stage of pleural mesothelioma is divided into two parts: 1A and 1B. In stage 1A, tiny tumors develop in one or both layers of the pleural lining on one side of the chest. In stage 1B, the tumors start spreading into other tissues next to the pleural lining. This may include the lung tissue under the lining or the chest wall outside of it. Cancer could also spread into the muscle under the lungs (the diaphragm) or the area between the lungs (the mediastinum). Even if mesothelioma has spread to nearby tissues, a stage 1 diagnosis means the cancer has not spread to any lymph nodes or distant sites throughout the body. Peritoneal mesothelioma does not have an official staging system. However, doctors typically think of it as early-stage cancer if it has not spread beyond the lining of the abdomen. Mesothelioma cancer is rarely diagnosed at stage 1. At this stage, most patients do not have symptoms, or symptoms are so mild that patients do not feel they need medical attention. Mesothelioma cancer is rarely diagnosed at stage 1 for this reason. Stage 1 cases are often discovered by accident when a doctor performs an X-ray or CT scan while looking for something else. Other stage 1 cases are caught because a patient with a known history of asbestos exposure received cancer screening. Patients and doctors often mistake mesothelioma symptoms for more common illnesses such as the flu or pneumonia. Symptoms are caused by tumors that begin to wrap around the affected lung and constrict it. The patient may experience pain, difficulty breathing or a chronic cough as tumors grow. These symptoms can also be caused by fluid building between the two layers of the pleural lining, which puts pressure on the lung. This condition is called pleural effusion, and it is a common sign of cancer forming in the lining of the lungs. There are three staging systems for evaluating how far pleural mesothelioma has spread. They use somewhat different definitions for stage 1. The TNM system is the most commonly used. TNM Staging System: Mesothelioma is in the pleura on one side of the chest, and it may have begun to spread into tissue in the lung, chest wall, diaphragm or mediastinum. Cancer has not spread to lymph nodes or distant sites. Brigham Staging System: Tumors remain within the pleural lining of the lungs. Cancer has not spread to the lymph nodes. Butchart Staging System: The cancer affects the pleura on only one side of the chest. Tumors may have spread to the heart sac (pericardium) or breathing muscle (diaphragm). Doctors recommend a multimodal approach combining surgery, chemotherapy and radiation therapy for stage 1 patients. Patients with localized cancer have the most treatment options available to them. But, it also depends on the patient’s overall health. Patients must be in good enough health to handle an aggressive treatment plan. Patients who undergo multimodal therapy may live years beyond the average mesothelioma prognosis. There are two major surgery options for pleural mesothelioma. One removes the diseased tissue around the lung, while the other also removes the lung. Which option is best depends on how far the cancer has spread and how much surgery the patient’s body can handle. Alimta and cisplatin are the most common chemotherapy drugs for mesothelioma. Doctors may use chemotherapy on its own or in combination with surgery. After a patient recovers from surgery, they usually receive chemotherapy. The goal is to kill any remaining cancer cells in their body. Doctors traditionally use radiation therapy after surgery to prevent local recurrence. Applying radiation therapy before surgery might improve survival rates for certain patients. Many early-stage patients in otherwise good health qualify for mesothelioma clinical trials. These voluntary research studies test experimental drugs and therapies not yet approved by the U.S. Food and Drug Administration for mainstream use. Unfortunately, there is no cure for any stage of mesothelioma. 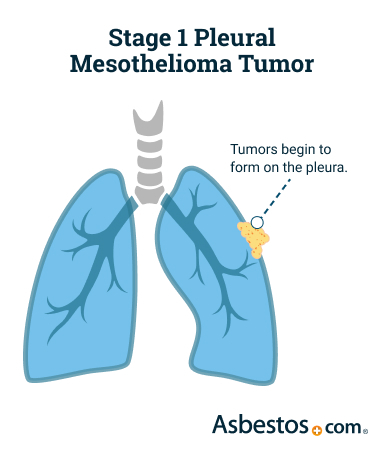 The prognosis for stage 1 mesothelioma is favorable compared to later stages, but the fact remains that pleural mesothelioma is an aggressive cancer with no cure. In the past, most patients have not survived longer than two years after diagnosis. Every day, doctors and researchers work to develop treatment strategies in hope of finding a cure. At the same time, many mesothelioma specialists are optimistic they may soon be able to manage this form of cancer as a chronic disease, rather than a terminal illness. A number of notable mesothelioma survivors — particularly among those with peritoneal mesothelioma — have outlived their prognosis by years thanks to new treatment techniques. Approximately 41 to 46 percent of stage 1 mesothelioma patients survive two years and 13 to 16 percent survive five years. Survival rates are calculated from the statistics for thousands of patients. The rate shows the percentage of patients who were still alive a certain amount of time after they were diagnosed. This rate explains what happened to a large group of patients in the past. It can only give you a general idea about what to expect from an individual diagnosis in the present. Life expectancy with stage 1 mesothelioma depends on a number of factors, especially the cancer cell type and the patient’s age and physical fitness level. Mesothelioma is a rare, complex disease, and every case is different.